We understand the process of decomposing documents into templates and data. Data is transformed into smart decision-tree interviews. Templates are coded and formatted. The assembly engine does the rest. A well designed document automation system can improve efficiency by a factor of 5 or more. We assist small to mid-size organizations in creating solutions to real world problems. From application design, development and testing -- through deployment, training and maintenance -- ProSoft provides an end-to-end solution. Contact us to discuss solutions to your business problems. Want to See an Interactive Interview? The link below is an example of how you can add "smart" content to your website. We can create one or more custom interviews that can be dropped on your site using a simple URL link. You can decide whether or not your client can download a finished document at the end of the interview. To begin the interview, click the link below. You will be asked to "Register". Click the Register button and supply a user ID and password that you create. We design the roadmap -- then build the road. First, we work with your team to understand your current business processes. Requirements are defined as we collaborate with your subject matter experts. Finally, we develop a project plan and timeline. This approach helps ensure the project remains within scope and budget. Your application is built using HotDocs, FormTool or another suitable platform. Input data is converted to user-friendly interviews with context sensitive help. Background computations are programmed to do the heavy lifting (managing complex text assembly, date calculations and mathematical computations). Documents are converted into smart templates. The system is thoroughly tested using sample fact patterns from your most common business scenarios. When your application is ready to deploy, we assist with setup and installation. Templates can be published to individual desktop PCs or a LAN. 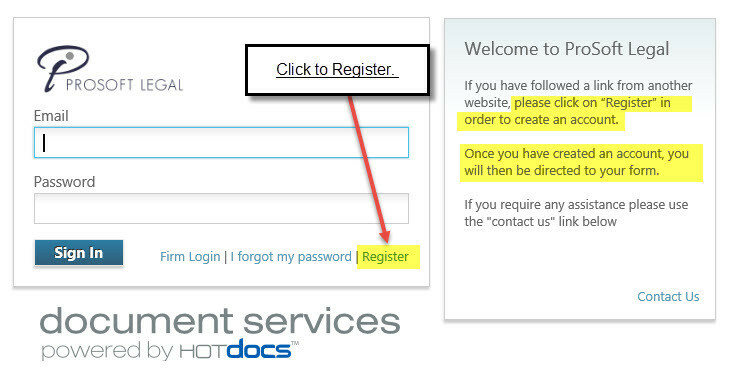 For our HotDocs' Document Services cloud platform customers, we take care of licensing, setup and site testing. Contact us for more information about the unique opportunities available to cloud users. We can train your team to take advantage of your custom application. Training can be managed using remote technology or we can come to your site. Training plans are tailored to your organization's needs and budget. ProSoft Associates can create user manuals and quick start guides to keep your users engaged and on track. Documentation can be delivered in electronic or paper format. After your system is delivered, we can assist with on-going support, maintenance and updates or train your team to maintain the system. Annual support and maintenance contracts are available at a reasonable price.